Image by Boisvert et al., ref. 3, p. 1. Figure 1. 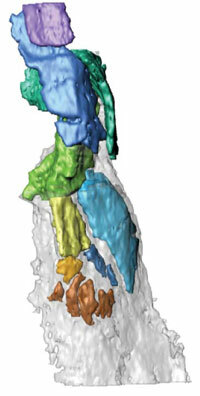 CT scans of Panderichthys’ fin show that it has a fin structure like Tiktaalik. Once more, fish-to-tetrapod evolution is paraded around,1,2 this time with a study suggesting that Tiktaalik, the ‘poster boy’ of fish–tetrapod evolution, is not quite all it’s cracked up to be. There’s a new kid on the block, the 90–130-cm-long Panderichthys rhombolepis. Except, Panderichthys isn’t exactly new; it was actually named in 1941.3 And it’s supposedly older too: 385 million years (Ma) old in comparison to Tiktaalik, which is supposedly 380 Ma old. However, a recent study has suggested that Panderichthys’ fin may be closer to tetrapods in morphology than Tiktaalik, 4 although evolutionary theory would predict that tetrapod characteristics would be more recent. Boisvert et al. have based their analysis on the pectoral fin of one particular Panderichthys fossil, which they reconstructed from a CT scan study of the fossil, which they then used to reconstruct a 3D image of the fossil fin. Panderichthys was found to have multiple ‘digits’ at the end of the bony part of the pectoral fin similar to Tiktaalik’s, which Boisvert et al. made out to be homologous with digits on tetrapod limbs (figure 1). Aside from the general biological5 and theological6 problems with excluding common design, Panderichthys is still unequivocally a fish with fins. ‘Shrink Tiktaalik’s [and Panderichthys’] radius and reposition it so that it articulates other bones further down the limb. ‘Evolve a radiale [a third bone alongside the ulnare and intermedium that articulates with the radius]. ‘Dramatically repattern, reposition, and transform the existing radials by lining them up, separating them out to form digits. ‘Evolve metacarpals and phalanges so that there are real digits extending distally from the radius. Another important consideration is function. Since these particular fins have never been seen in live operation, there is no reason to suggest that they provide evidence for fish–tetrapod evolution. Coelacanth is a prime example. Before it was known that its limbs were used for deft manoeuvring of the fin, the coelacanth’s limbs were thought to be evidence of the fish–tetrapod transition. Now we know better.9 The situation is no different in Panderichthys. However, there are no lineages—merely the comparing of finished products to come up with the illusion of a lineage. For all the complex 3D imaging that went into this paper, there really is not much in it. It further confirms that Tiktaalik is an unequivocal fish, related to Panderichthys, and it tells us that fish–tetrapod evolution is a mess. This is not a surprise from a biblical perspective, because evolution fails to explain the evidence, and these fish were created fully functional. Primordial fish had rudimentary fingers, PhysOrg.com, 22 September 2008. Return to text. Bowden, R., Discovery of fish with fingers gives evolution new twist, The Tech Herald, 21 September 2008 Return to text. Gross, W., Über den Unterkiefer einiger devonischer Crossopterygier (About the lower jaw of some Devonian crossopterygians), Abhandlungen der preußischen Akademie der Wissenschaften Jahrgang 1941 (Treatises of the Prussian Academy of Sciences Year 1941). Return to text. Boisvert, C.A., Mark-Kurik, E. and Ahlberg, P.E., The pectoral fin of Panderichthys and the origin of digits, Nature, doi:10.1038/nature07339, Published online: 21 September 2008. Return to text. Sarfati, J., Refuting Evolution 2, Master Books, Green Forest AR, 2002. See chapter 6: Argument: Common design points to common ancestry. Return to text. Ahlberg, P.E. and Clack, J.A., Palaeontology: A firm step from water to land, Nature 440(7085):747–749, 6 April 2006. Return to text. Luskin, C., An ulnare and an intermedium a wrist do not make: a response to Carl Zimmer, Discovery Institute, 1 August 2008. Return to text. Jaroncyk, R. and Doyle, S., Gogonasus: a fish with human limbs? Journal of Creation 21(1):48–52, 2007. Return to text. Autapomorphy is a cladistic term for a characteristic that is unique to the group, found neither in the groups said to be closest relatives nor in their supposed common ancestor. Features supposedly derived from an autapomorphy in a common ancestor are called synapomorphies. Return to text. I.e. their common features cannot be explained by inheritance from a common ancestor with such a feature, which would then have been an autapomorphy; such common features are called homoplasies, which are ubiquitous in many alleged transitional series. Return to text. Daeschler, E.B., Shubin, N.H. and Jenkins Jr, F.A., A Devonian tetrapodlike fish and the evolution of the tetrapod body plan, Nature 440(7085):757–763, 6 April 2006. Return to text. ReMine, W.J., The Biotic Message: Evolution versus Message Theory, St Paul Science, St Paul, MN, pp. 289–290, 344–346, 1993; and review: Batten, D., Journal of Creation (CEN Tech. J.) 11(3):292–298, 1997. Return to text.